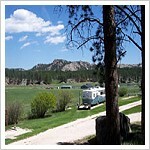 The Roost Resort is a small campground located in the Black Hills of South Dakota. The park is quiet and peaceful and in a beautiful location. The Resort consists of 7 cabins, 2 family cabins, a kamping kabin, and a small campground and RV Park. The campground consists of 12 RV sites and 5 tent sites. The property has outstanding views of the Black Hill’s forest and granite peaks. Most of the sites are under shady pines with great views all around! The staff was very nice and made us feel at home. Rates are extremely reasonable… tent sites are $20, and full hook-up RV sites are $27. There is a 5 acre meadow for a relaxing evening stroll, or a healthy jog if you’ve a mind to. They have a play area for the children, and horseshoes for everyone. The Roost Resort is centrally located to visit the many sights and attractions in The Black Hill’s. The town of Custer is 1 1/2 miles west and the entrance to Custer State Park is about 2 miles east. Mount Rushmore National Memorial is a 30 minute drive, and Crazy Horse Memorial is a 10 minute drive. It’s an excellent base for exploring the area.